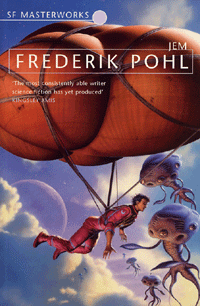 Frederik Pohl's Hugo and Nebula nominee Jem (1979) is a rich, complex and conflicted novel that considers what a future of planetary exploration may look like through the lens of the late Cold War politics of the eighth decade of the twentieth century. The novel's cataclysmic conclusion is followed by an afterword considering the intriguing proposition that humanity will only thrive subsequent to its genetic makeup having been tempered by other influences. Left to its own devices, Pohl implies that the history of humanity will continue to repeat the cycles of tragedy and farce Marx identifies in the 'The Eighteenth Brumaire of Louis Bonaparte'. I'm a diehard Asimov fan; of his stories, I'd have to go with The Deep and The Dead Past.